Posted May 31st, 2016 by CuttingEdgeLaser & filed under News. Cutting Edge Laser continues a many year history of volume production Cherry Wood Incense Burners for a prestigious incense manufacturer in Boulder Colorado. These elegant, precision laser cut and engraved burners are made in production and sell on this company’s website or in retail stores all across USA. The material used is strong Cherry Wood. They are 8.7” x 1” x 1/4”. 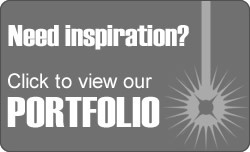 Contact us if you are a reseller, or manufacturer needing your designs volume produced. Laser cutting leather serves leather craftspeople in 2 ways. Volume Production & Precision cutting. When leather artists cut by hand, often lines are imperfect and fraying occurs. 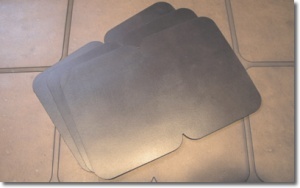 Laser Cutting creates perfect cut lines, .001” accuracy & repeatable cuts. During construction of parts, for example, in wallets photographed here, leather craftspeople appreciate accurately cut parts for easier assembling and sewing parts. CNC Lasers are also able to cut diamond shaped sewing holes leather artists require. 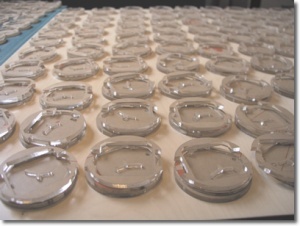 Laser Cut Acrylic “Big Watch” Production Parts for Electronics Firm. Volume Laser Cut Parts, for products involving electronic circuitry and internal moving, mechanical parts, require precision, repeatable parts cutting. Accurate assembly of parts is critical for products such as this. Stacking of parts also need accurately located metal fasteners. The company who, for many years, contracts Cutting Edge Laser to laser cut parts, sells their units to customers who will assembly the units themselves. Laser Engraved & Cut Wood Team Member Plaques. 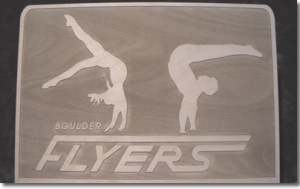 Whether engraved from photos, drawings, or computer graphics, laser production provides opportunities to market team or company brands. Images and graphics produced in volume, most accurately display intentions, messages, & signage when elegantly and accurately engraved & cut with the Co2 Laser. Posted May 2nd, 2016 by CuttingEdgeLaser & filed under News. What are the steps in the manufacture process? Order is called in or emailed. CuttingEdgeLaser receives customer’s product concept, or files, then designs and/or creates laser ready layouts. Layouts are emailed back for customer approval. Laser cut prototype or production photo is emailed back to customer, then Production begins. Production Cutting Fixtures are created for the Laser Bed. Quality Control monitors all steps of production. Customer is updated on timetable of production. Cleanup: Parts are inspected, and the necessary labor (touch up), is performed to complete high quality production that is initially promised. Shipping of parts are arranged & with care to always ship on time. 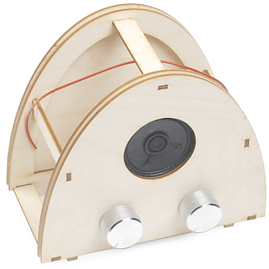 SparkFun Inc. FabFM Electronic Radio Kit. Cutting Edge Laser fabricates all wood production parts, for precision fitting of electronic circuitry and moving parts hardware. This product can be seen and purchased by clicking here. Posted April 15th, 2016 by CuttingEdgeLaser & filed under News. 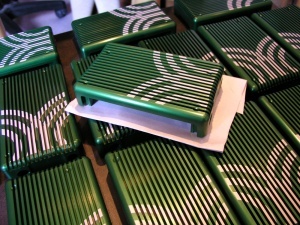 Why Companies should outsource Laser Cut & Engraved Products, Parts, & Service. Small to Medium sized businesses often cannot afford high priced machinery. Larger businesses may NOT want to spend in-house time and internal costs for volume production. It is to the advantage of most businesses, therefore, to outsource parts fabrication to save material and machining costs. 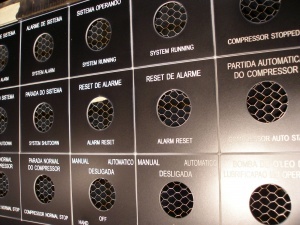 More than this, it is costly to hire employees needing to be trained to design using CAD, Computer Aided Design programs, then run high-tech machinery, such as CNC, computer numeric controlled equipment. When businesses have uncertain projection for future volume production. Frequent design changes, and the resulting fixturing and machining changes which follow. Lack of in-house precision machining knowledge and expertise. Outsourcing helps companies gain access to higher technologies. Lack of storage space to store extra inventory of volume Products and Parts. Scheduling outsourced parts manufacturing as needed eliminates need for storing backstock. Knowledge of machining capabilities and limitations, needs to be considered when designing products. 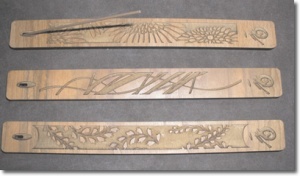 Therefore, rely on input and expertise of outsourced laser cutting and engraving specialists. Outsource specialists, such as CuttingEdgeLaser, are available to help co-design and develop parts and products. Outsourcing minimizes overhead costs by not needing to own equipment. Businesses then have a greater handle of cash flow and easier accounting. Outsourcing helps monitor parts and products inventories more easily. Outsourcing helps companies spend more time on those in-house manufacturing processes where it is most capable. Outsourcing assures businesses when increases in volume parts ordering and increased product demand are fulfilled on time. Rely on outsource manufacturing professionals to find, purchase, and use the very best and most appropriate materials for your projects. Outsourcing minimizes the purchasing department’s time researching material and parts sourcing. You can always rely on outsourcing Cutting Edge Laser, with 18 years experience, to successfully produce precision part and products from your important designs. And we are always here, ready, and able to meet your growing volume demands during your company’s successful product sales and business growth. Contact CuttingEdgeLaser today for a quote today! Posted February 26th, 2016 by CuttingEdgeLaser & filed under News. Cutting Edge Laser recently completed a production job for a company requesting silicone rubber cutting. Silicone is available in solid sheets, tubes and strips. Parts can be molded, then identification can be laser engraved. Silicone rubber maintains it’s shape even after much pressure applied for long periods of time (ie: gaskets and washers). Some products using silicone rubber are: cell phones, communication electronics, computer products, TV’s, plumbing products. Silicone material appropriate for laser cutting and engraving has gone through a platinum curing process. Much research and usage of silicone rubber is evident in high-tech products since the early 1980’s. Contract Cutting Edge Laser to cut your business’s parts and products. We strive for precision cutting, and maintain very accurate repeatable volume production.